The European Commission has awarded Bremen (Germany) and Östersund (Sweden) for their important work on furthering sustainable urban mobility in their cities. Bremen won the 2014 Sustainable Urban Mobility Plan (SUMP) Award for its creative methods in monitoring and evaluating its SUMP, while Östersund won the 2014 European Mobility Week (EMW) Award for its outreach activities that encouraged citizens to travel sustainably during the EMW. 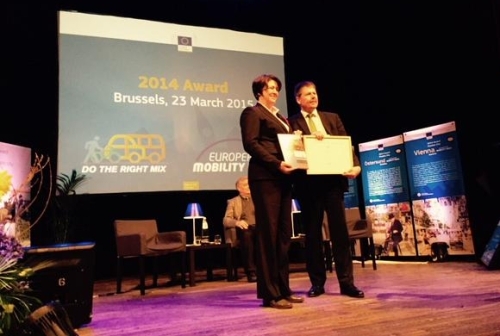 Representatives of the two cities were presented with their awards at a ceremony in Brussels on 23 March. Bremen received € 10 000 to further promote work on its SUMP, while Östersund’s prize is a three-minute professionally produced video showcasing the city’s urban mobility achievements. SUMP award finalists Dresden (Germany) and Ghent (Belgium) were complimented for their long-standing commitment to sustainable urban mobility and for being examples of best practice in monitoring and evaluating, while Thessaloniki (Greece) received a special mention for the ongoing implementation of its SUMP despite a difficult working environment. EMW Award finalists Murcia (Spain) and Vienna (Austria) were also praised for their efforts during the week. Case studies detailing the work of the SUMP Award finalists will appear on Eltis over the coming weeks – starting with Bremen’s, which is now online. For more information, visit the European Commission’s website.